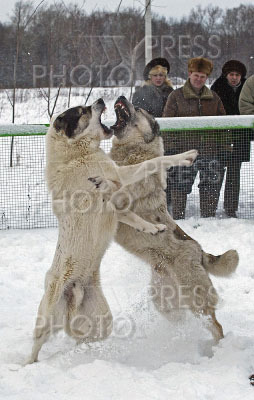 Dog fighting in Kolomna near Moscow.Some owners train thier dogs for fighting as well as some dog breeds were cultivated specially for fighting. June 12,2013. Moscow,Russia. Russian protest leader Alexei Navalny was sentenced in Kirov to five years in jail for theft on Thursday,July 18, it is an unexpectedly tough punishment which his supporters said proved President Vladimir Putin was a dictator ruling by repression. Pictured: Anti-Putin rally in Moscow. One of the leaders of Russian opposition Alexei Navalny with his wife Julia (L) participating in the rally. Skating rink on the Red Square in Moscow. Plastic Breast Surgery - Breast Correction. Hard rock group `Lordi` in Moscow. 31 May. The SportAccord Convention 2013. Pskov region of Russia.Pictured:Historical reconstruction of the The Battle of the Ice (also known as the Battle of Lake Peipus) to mark 770 anniversary of the Battle. The Battle of Lake Peipus was a battle between the Republic of Novgorod and the Livonian branch of the Teutonic Knights on April 5, 1242, at Lake Peipus. The battle is notable for having been fought largely on the frozen lake.